Wet wipes, used for sticky fingers and removing eye make-up, as well as on other parts of the anatomy, could themselves be wiped out over the next couple of decades. The government says its plan to eliminate plastic waste "includes single use products like wet wipes". The wipes contain non-biodegradable plastic. So manufacturers will either have to develop plastic-free wipes or consumers will have to go without. Wet wipes are behind 93% of blockages in UK sewers, a key element of the infamous giant obstacles known as fatbergs, according to Water UK, the trade body representing all of the main water and sewerage companies in the country. That has prompted the government and industry to focus on persuading consumers not to flush them into the waste water system. "We are continuing to work with manufacturers and retailers of wet wipes to make sure labelling on packaging is clear and people know how to dispose of them properly," a spokesperson for the Department of the Environment (Defra) said. However, Defra says it is also "encouraging innovation so that more and more of these products can be recycled and are working with industry to support the development of alternatives, such as a wet-wipe product that does not contain plastic and can therefore be flushed". 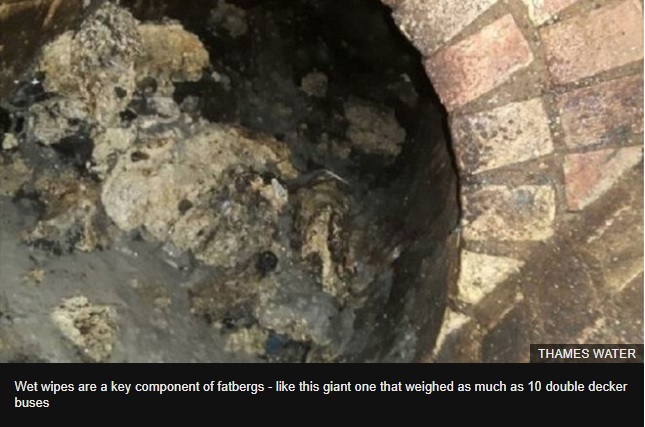 Reality check: What is a fatberg? Despite the name, fatbergs are actually mainly made up of wet wipes. They account for a startling 93% of the material blocking our sewers according to Water UK, the membership body for water providers. They collected samples to analyse from blockages in sewers, pumps and wastewater treatment works. Wet wipes - mostly baby wipes, but also those used to remove make up and clean surfaces - made up the vast majority of the material. Fat, oil and grease only made up 0.5%. The other 7% was made up of a range of other materials including feminine hygiene products, cotton pads and plastic wrappers. Toilet paper made up just 0.01% of the material blocking our pipes and sewers. 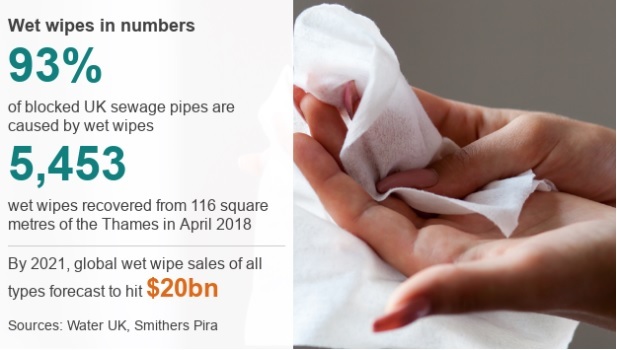 Environmental charities including Greenpeace and the Marine Conservation Society say they are not surprised by this high number, since wet wipes are often marketed as "flushable". The wet-wipe industry has flourished over the last decade with manufacturers offering an ever broader range of wipes, for sensitive skin, babies' bottoms, removing make-up, applying insect repellent, deodorant or sunscreen. However most are made of polyester and other non-biodegradable materials. One manufacturer, Jeremy Freedman, managing director of Guardpack, has written to his MP to say banning them would be environmentally disastrous. Mr Freedman told the BBC what he saw as their benefits: "If you go to TGI Friday and Nando's, for example, you'll see our products there. "These wipes are biodegradeable, take 3ml of liquid on average. If they weren't able to use these, they would need to wash their hands, using on average one litre of water. "They are also widely used in the medical industry and, for people with incontinence and disabled people, these wipes are critical to their lifestyle." He said many of the wipes he produced were made of 100% biodegradable materials, but warned they were under no circumstances flushable. Defra is in the process of exploring how changes to the tax system or charges could be used to reduce the amount of single-use plastics wasted. Prime Minister Theresa May pledged in January to eradicate all "avoidable plastic waste" by 2042. The government has also said it will consult over whether or not to ban plastic straws, cotton buds and drink stirrers.